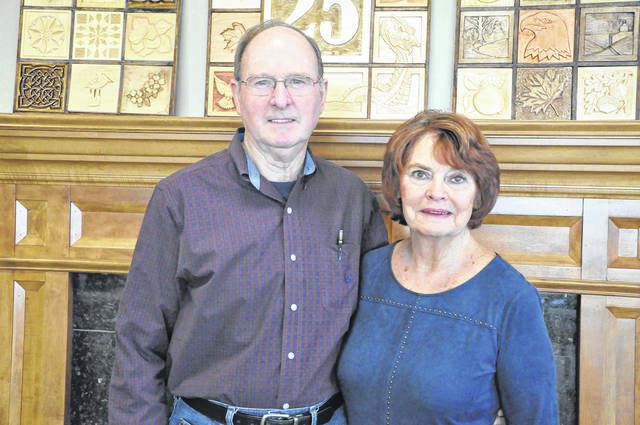 Sunbury couple Bob Kelley and Judy Silverthorn pose in front of the fireplace at SourcePoint. Kelley said they went on their first date at a Columbus Clippers game six months ago. Two Sunbury residents recently found romance in a very unlikely place — the fitness center at SourcePoint. Bob Kelley said he joined SourcePoint about two years ago and was working out in the downstairs fitness center when Judy Silverthorn caught his eye. “I saw this pretty redhead behind the desk,” Kelley said with a smile. “We had our first date about six months ago,” Kelley said. Kelley and Silverthorn said they had both been married before, and Silverthorn said the thought of meeting someone to date at SourcePoint had never crossed her mind. Kelley used to work for an electricity provider before he retired and said he joined SourcePoint to get better at golf after he attended a golf clinic a few years ago. Kelley said he never expected to find a new relationship. “It’s really more exciting when you didn’t expect it and when you weren’t looking,” he said. Silverthorn said it’s been great finding new friendships at SourcePoint and to participate in activities. “SourcePoint gives a lot of opportunities to meet people,” Silverthorn said. Silverthorn added she is a retired hairdresser and salon owner, and she joined SourcePoint to get out and socialize. “I really wanted to engaged with other people,” she said. Silverthorn said she and Kelley play Euchre together and do cardio exercises at SourcePoint. She said she also takes a line dancing class by herself — for now. “He’s not a line dancer, but I’m working on him!” Silverthorn said with a laugh. “It was totally unexpected but then we feel like teenagers again!” Silverthorn said.